For this skateboard cake, I baked a 2 layer 9x11 cake and a 2 layer 9"round cake. I cut the round cake in half and put on each side of the 9x11 to form the curved sides. I then iced the whole cake in green buttercream making it smooth on the top so you couldn't tell there was 3 separate pieces. I then tinted some fondant bright green and rolled it out 1/4" thick and placed over the whole cake. I smoothed it around the cake. I then tinted some fondant orange and some yellow and rolled each color out. I placed the colors next to each other touching, some overlapping and rolled them together with a rolling pin to get the swirled effect of the flames. I cut the flames out with a fondant cutter. Stick the flames all around the base of the cake with water. I made the wheels out of fondant. The trucks are made from popsicle sticks sprayed with silver edible spray. The brackets are made from cutting 2 squares out of fondant and spraying with silver edible spray. I put those all together on the cake. I then tinted some red and some black fondant and did the same thing to get the swirled effect and cut the letters out for the name with a fondant cutter and put them on the top! Oh now that is just too frickin' cute! Join in and write your own page! It's easy to do. How? 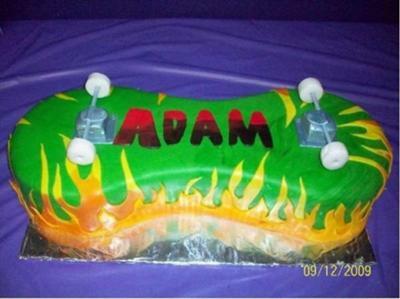 Simply click here to return to Sports Birthday Cake Designs.